Traditional Tater Tot casserole with all the trimmings (full-fat cheese, butter, fatty ground beef, and regular cream of mushroom soup), gets a much-needed overhaul with reduced-fat cheese, lean ground beef, lower-fat cream of mushroom soup, and veggies like mushrooms and carrots. 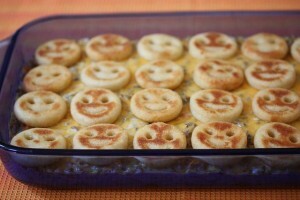 Kids will laugh out loud when they see the smiley face fries on top. SPECIAL OFFER: SchoolFamily.com readers can purchase No Whine With Dinner at 30 percent off the list price, and get free shipping, by ordering the book here and using this promo code: FS2011. Preheat the oven to 425° F. Bake the fries according to package directions. When done, remove from oven and set aside. While the fries are cooking, heat the oil in a large Dutch oven or saucepan over medium-high heat. Add the mushrooms and cook, stirring frequently, until softened, about 5 minutes. Add the meat, carrot, garlic powder, and pepper and cook, breaking up the large pieces, until the meat is no longer pink and the carrot is tender, about 5 minutes. Drain excess fat and season with salt and additional pepper to taste. Stir in the soup, milk, and, 1½ cups of the cheese (the mixture will seem very thin at this point, but don’t worry). Heat, stirring frequently, until the mixture comes to a simmer. Remove from the heat. Arrange half the cooked fries in a 9 x 13-inch baking pan or dish. Top with the meat mixture, the remaining half cup of cheese, and the remaining potato smiles. Cover loosely with aluminum foil, and bake until the mixture is bubbly, about 10 minutes. Not liking smiley-face potato fries is simply inhuman. The question is how to sneak vegetables into this and see whether my girls will eat it. I would love to try this. Fries, ground beef and cheese. 3 of my best friends.